Every organization we know of would like to have the benefits mentioned in each of the blue boxes below. We could all benefit from more genius thinking, stronger IQ and EQ, elimination of blame and tools to dramatically improve performance just to name a few. No organization is perfect. We all need to continually work at being the best we can be. And when we think we are perfect, we need to look again. We can always be better. 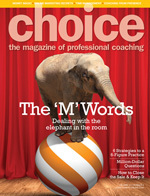 We have the secret or "The missing piece" to maximizing human performance. This missing piece is CLI's Science of Mind-Kinetics®. It is this science which brings results with great speed and efficiency. 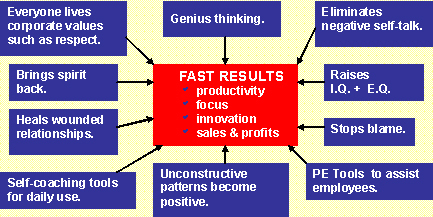 CLI is the only corporate training company that can offer the profound results listed below. For example, to stop blame in the workplace is a difficult task. We make it easier because the tools and concepts taught to the individuals and groups get to the root cause of our blame and literally assist us in 'changing our minds' or shifting our paradigms from negative to positive. Of The CLI Guarantee "We guarantee that every person going through our Corporate Prosperity Programs will experience permanent positive change." The blue boxes outline the kind of changes you can expect.